While I remember watching Sleeping Beauty as a kid, it's not one of those Disney movies that I watched over and over again. Instead, it's one that I think I came to appreciate more as I got older (except for one little thing...more on that later :). Sleeping Beauty just has a really medieval, classic fairy tale feel about it. It's one of the few classic Disney movies that doesn't feel modern in any way to me. And I think it's meant to be that way. 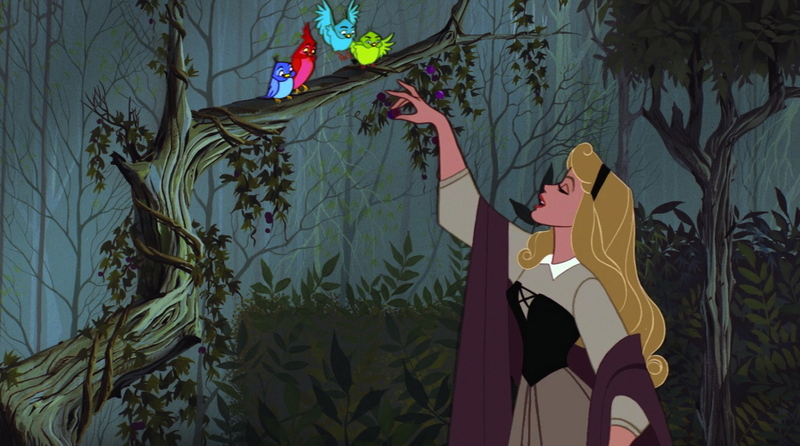 The music is adapted from Tchaikovsky's Sleeping Beauty ballet (so it doesn't feel modern in the least), and the whole look of the film was inspired by medieval art. For me, personally, Sleeping Beauty probably makes it into my top five favorite classic Disney films (I'm considering "classics" as those made between the 30s and the 70s). 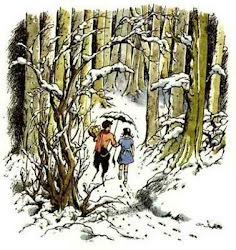 As far as the traditional fairy tale stories go, I like it more than Snow White and the Seven Dwarfs, but a little less than Cinderella. The scene where the curse is finally fulfilled is so creepy. I remember thinking that as a kid, and I still think so. :) The part when Aurora is left alone and Maleficent lures her into the fireplace-turned-passageway. And that eerie music is playing and Aurora's skin looks green. Ew. This was the first time I had noticed how strong the good versus evil theme is in this movie. I mean, the good fairies give Prince Philip the Shield of Virtue and the Sword of Truth! And there's constantly talk of good triumphing over evil and true love conquering all. As for the ending, the battle between the prince and Maleficent wasn't nearly as long and epic as it seemed to be when I was little...but I still enjoy it. :) I just love the part where the thorns grow up around the castle and when Maleficent transforms into a dragon. I really do love Sleeping Beauty. It's a gorgeous movie with a uniquely old-fashioned look about it, compared to most Disney classics. I would love it even more if I could suspend my disbelief at the whole "love at first sight" part. Ha. :) And I'm really, really excited about the film Maleficent coming out later this year! Have you guys heard the super-creepy version of Once Upon a Dream from the film trailer? I usually don't like it when modern singers attempt classic Disney songs, but this is amazing. Up next on the list is 101 Dalmatians and the infamous Cruella De Vil! How about you? Do you like Sleeping Beauty? Are you excited for Maleficent? Merriweather is probably my favorite fairy! :) I love how she's so no-nonsense and honest. I love reading your posts about classic Disney movies! I haven't seen this one in years. I watched it a lot when I was little, but I was never as fond of it as I was of, say, Beauty and the Beast and Aladdin. But I'd love to watch it again now, and see what I think of it. Especially as Maleficent is coming out soon. Thanks! :) I love writing them! Yes, I read East last year (I think?) and really, really enjoyed it. 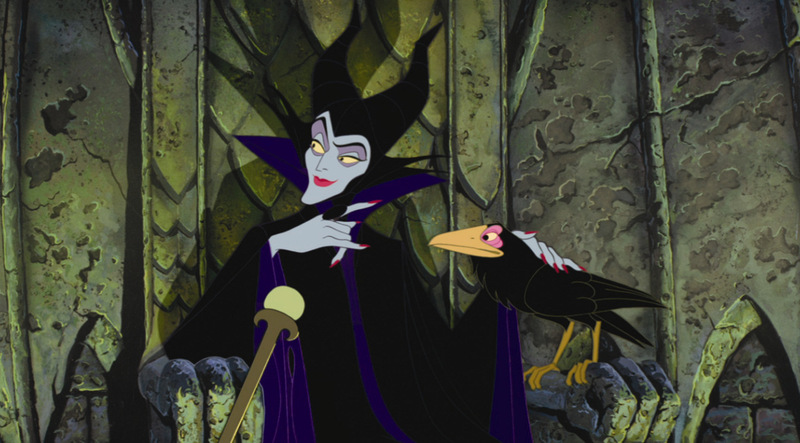 Seeing the new Disney Maleficent movie though is high on my priority list. It looks quite magnificent so hopefully it'll live up to fans standards. Great review! I love the "tsp" part, too. :) And I also hope Maleficent will be awesome! The Great Gatsby: book and film discussion. Book haul (bargain books and thrift store finds). Miss Marple in the 60s. 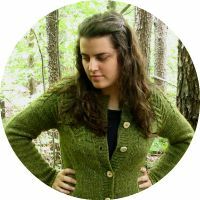 Getting to know me (and you! ).